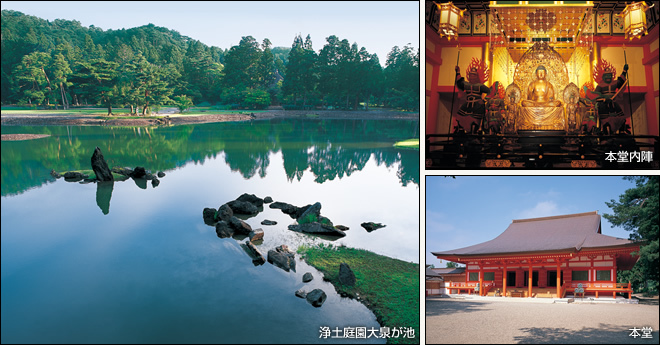 Special Historical Site and Special Place of Scenic Beauty The garden represents the Pure Land Buddhist world and beauty of Japan. Mōtsū-ji Temple was founded in 850 by Ennin (Jikaku Daishi), but most of the halls were built in the 12th century, during the period from Motohira, the second generation Fujiwara lord, to Hidehira, the third generation lord. With 40 temple buildings and 500 priests' quarters, its size and splendor rivaled that of Chūson- ji Temple. After the downfall of the Ōshu Fujiwara clan, all of the buildings were destroyed by fires, either natural or in conflicts but the Pure Land garden with the Oizumi ga Ike Pond and the foundations of the Heian period temples were maintained in almost perfect condition, and Mōtsū-ji is designated as both a Special Historical Site and a Special Place of Scenic Beauty. The creator of the garden is unknown, however, it is apparent that he was an expert on the Sakutei, (an 11th century treatise on garden making) as elements of Sakutei-style design can be seen in many places. The garden was made around a large pond with two islands, one peninsula on the southeast shore and three on the south shore. On the north side of the pond are the remains of a Kondō (Main) hall with a bell tower and a sutra repository tower. It is said that in the original garden, bridges connected this hall with the central island and the great south gate, and based on this information we know that it was designed in the shinden-zukuri (aristocratic residential) style. The central island is curved like a comma, and round stones are laid out around the edges of the pond and the island. The shoreline, with its beach, peninsulas and rugged mountain rocks is supposed to represent a seacoast. One of the most beautiful scenes in the garden is that of the small island off the peninsula on the southeast side of the pond where a standing rock, more than 2m high, is tilted at exactly the right angle to balance the broad expanse of the water.